This calculator will compute a loan's payment amount at various payment intervals -- based on the principal amount borrowed, the length of the loan and the annual interest rate. Then, once you have computed the payment, click on the "Create Amortization Schedule" button to create a chart you can print out. We also offer more specific mortgage amortization & auto amortization calculators. Borrowed funds are paid back over time, using a variety of accounting methods. Once cash is borrowed, a repayment timeline begins, taking several factors into account. There is no cookie cutter approach to loan repayment, because the terms and conditions associated with each loan are unique. The length of time it takes to repay loans and the total amount of interest paid are functions of the agreements made between borrowers and lenders. As repayment progresses, each billing cycle requires a particular payment, which is split between amounts applied to principal, and totals due resulting from interest charges. Amortization calculator tracks your responsibility for principal and interest payments, helping illustrate how long it will take to pay off your loan. 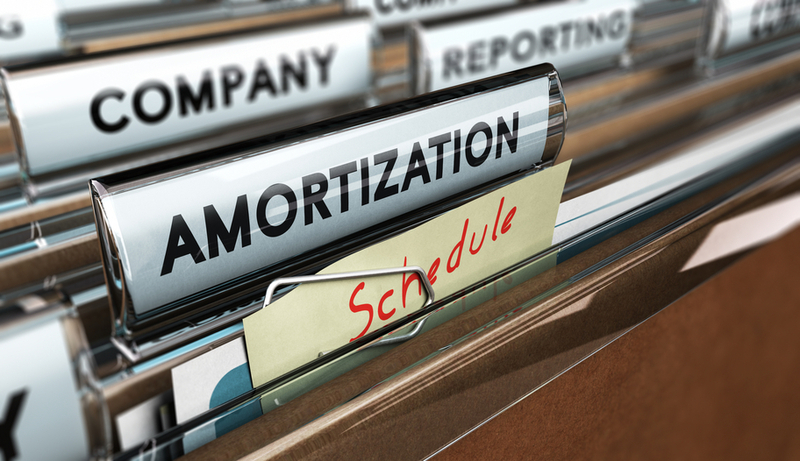 Amortization schedules use columns and rows to illustrate payment requirements over the entire life of a loan. Looking at the table allows borrowers to see exactly how loans are paid back, including the breakdown between interest and principal amounts applied. If you are considering a major purchase, requiring a loan, amortization calculator furnishes a tool for predicting what payments will be. By inputting information like total loan amount, and interest terms, total payment schedules can be crafted for a variety of scenarios. Affordability, especially for homes and vehicles, hinges on a number of influences, including personal income and total outstanding debt. As you assess your ability to finance major purchases, use amortization schedules to look ahead, outlining each future payment and its due date. Change calculations by altering parameters, creating side-by-side comparisons of amortization schedules. Loans are issued under a variety of terms, requiring borrowers to meet myriad repayment conditions. Some loans are weighted unevenly, calling for lump payments toward the end of financing periods. Amortization loans spread the principal payments more evenly, distributing the burden over the entire course of a loan's life. As final amortized payments near, borrowers are not subject to balloon payments or other irregularities. Instead, the original purchase price of the asset continues to amortize until it is completely paid-off. Balloon loans, or bullet loans, operate under a different set of rules than standard amortizing loans. While both credit options are used to finance the same things: Homes, cars and other expensive purchases, the way they get paid back are entirely different. To start, bullet loans require large payments toward the end of each loan's life. Borrowers pay toward balloon loans over time, just like their amortizing counterparts, but their payments are applied primarily to interest obligations. As a result, loans carry through to their conclusions with large principal balances still intact. The only way to satisfy balloon mortgages and other similar credit instruments is to wipe out the entire remaining balance with one final payment. While bullet loans serve vital functions for borrowers short on cash, they lead to problems when managed improperly. In many cases, balloon amounts are refinanced into conventional amortizing loans as they come due, spreading the payments out further. Whenever possible, use amortizing loan advantages to keep budgets manageable. Use loan payment calculator with amortization schedule to outline your debt responsibilities.